Chin augmentation helps to balance facial proportions in people with a “weak chin”. The facial bones also “inflate” the face decreasing the propensity to jowl formation and will slightly tighten neck skin. Removal of fat beneath the chin is done at the same time if appropriate. Many people who wear their hair to disguise their profile, or avoid having photos taken from side on have vastly improved self-confidence after this intervention. 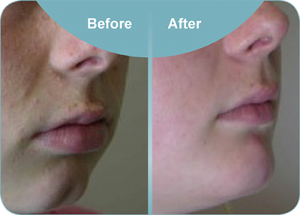 Cleft chin correction is also performed by Mr Davis and in most cases can be done under local anaesthetic. How is chin augmentation done? The chin bone can be moved forward using an incision inside the mouth (genioplasty). Alternatively an implant can be placed on the outside of the chin bone with an incision usually under the chin. Are there advantages to either technique? A genioplasty can be done in a way that tightens the muscles at the base of the neck. Chin implants can get infected, change position, thin the overlying tissues and potentially wear into tooth roots. Both techniques can stretch the nerve that gives feeling to the lower lip. In 5% of people there will be some permanent numbness somewhere after this surgery. Neither technique alters the tooth position. Both techniques can substantially alter a persons profile, facial balance and harmony. What does a genioplasty involve? The technique varies on each occasion depending on the movements planned but it is done using an incision inside your mouth and held in place with either a thin (1.2mm) titanium plate or dental wire. It is important not to detach the chin soft tissues at the front as this can lead to a so-called “witches chin”. Genioplasty and chin implant surgery is done for a fixed cost. For the current costs please either email us or phone us on 0800 268 526.The quoted cost for surgery covers everything including anaesthetist, theatre fees, consumables and all the follow up for dressings and checks in the first year after surgery. This cost includes GST. Can I see examples of Charles Davis genioplasty surgery? Examples of genioplasties performed by Dr Davis are shown during a consultation to illustrate the typical range of results, the limitations or surgery and the effect on the surrounding face and neck tissues.